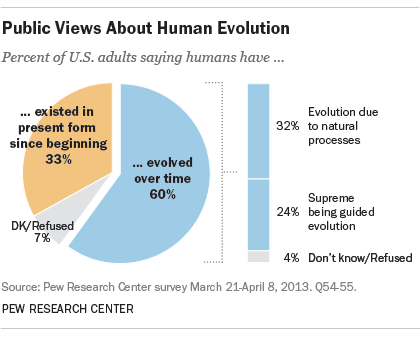 2 A minority of Americans fully accept the scientific explanation for the origins of human life. 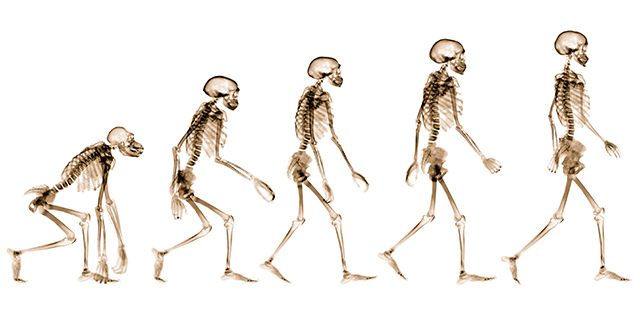 According to a 2013 Pew Research Center survey, 60% of Americans say humans have evolved over time, but only about half of that group (32% of U.S. adults overall) believes that humans and other living things evolved solely due to natural processes, the explanation accepted by the vast majority of scientists. About a quarter of U.S. adults (24%) say that humans and other life evolved, but that this evolution was guided by a supreme being. The same survey found that a third of Americans (33%) reject evolution entirely, saying humans and other living things have existed in their present form since the beginning of time. 3 Of all the major religious groups in the U.S., white evangelical Protestants are the most likely to reject evolution. 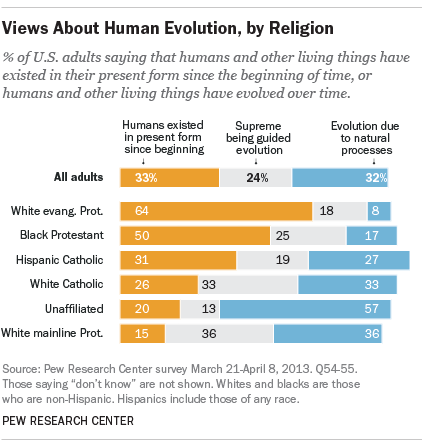 Nearly two-thirds (64%) of white evangelicals say that humans and other living things have always existed in their present form, while roughly one-in-ten white evangelicals (8%) say that humans evolved through natural processes. On the other end of the spectrum are the unaffiliated, a majority of whom (57%) said they believe that life evolved through natural processes. The rejection of evolution by most evangelicals is largely mirrored by their churches, such as the Southern Baptist Convention and the Lutheran Church-Missouri Synod, which explicitly reject evolutionary theory as being in conflict with what they see as biblical truth. 4 About a quarter of white American Catholics (26%) say that they do not believe in evolution of any kind, despite the church’s acceptance of it. The share of Hispanic Catholics in the U.S. who reject evolution and say that humans have always existed in their present form is even higher (31%). 5 A series of court decisions prohibit the teaching of creationism or intelligent design in public schools. In spite of efforts in many American states and localities to ban the teaching of evolution in public schools or to teach alternatives to evolution, courts in recent decades have consistently rejected public school curricula that veer away from evolutionary theory. In Edwards v. Aguillard (1987), for instance, the U.S. Supreme Court ruled that a Louisiana law requiring public school students to learn both evolution and creation science violated the U.S. Constitution’s prohibition on the establishment of religion.